AJ Styles defends the WWE Heavyweight Championship in a triple threat match against John Cena and Dean Ambrose tonight! When the recap is "in progress" hit F5 or refresh as often as you like for the latest updates. 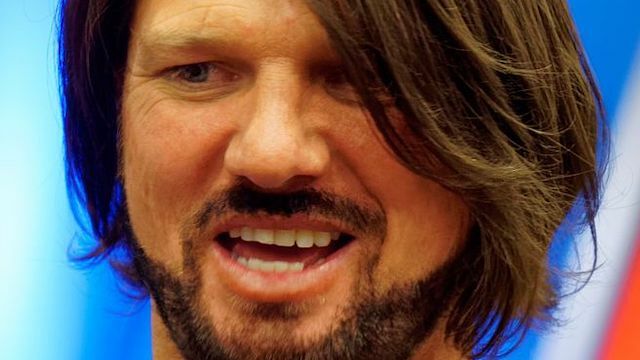 Jonathan Coachman and, later, WWE's official Twitter page announced that No Mercy will start with the AJ Styles-John Cena-Dean Ambrose Triple Threat Match. Tune in at 8:00pm EST for LIVE coverage of the championship match...and everything else. Curt Hawkins came out at 7:19pm with half of the crowd still coming into the arena. Hawkins' theme includes him announcing Curt Hawkins Facts. Hawkins announced that he did what he said he was going to do and that was he stepped into the ring at No Mercy. We got a big pyrotechnic display before he made a big announcement...he will be wrestling on Tuesday. Shane McMahon told Alexa Bliss that Becky Lynch won't be able to compete. Alexa demanded to be named the new SmackDown Women's Champion. Daniel Bryan said no and she will get her title match on November 8 in Glasgow on SmackDown. Nice, random date. But Alexa will be wrestling tonight. I know they did it a few months ago, but I hate that they got rid of the Vaudevillians entrance. Four former NXT tag teams (and three former NXT Tag Team Champions) making up the sides of this Kickoff match. After the shine the heels cut off Ryder. Ryder cut off Konnor while on the floor and began reaching for the tag...while he was outside the ring on the opposite side of the ring from his partners. Jason Jordan got the hot tag and it broke down into an 8-way brawl, with everyone hitting everyone with something. Finally Jordan pinned English with Grand Amplitude. They aired the entire pre-match video package at the end of the Kickoff show, started the ppv, brought out all three guys...and then they had to stand in the ring when they replayed the entire video package a second time. All three men went for their finishes in the first 30 seconds, but they very quickly spilled to the floor where Ambrose had control until Cena caught him on a dive and drove him into the ringpost. In the ring AJ and Ambrose both went for a German Suplex, so Cena ran over and gave them both a German Suplex at the same time. Ambrose got backdropped out of the ring and smacked his head off the steps and Cena hit a Code Red, of all things, on AJ for a 2 count. Ambrose returned just in time to take turns as everyone gave each other a sleeper hold. Dean hit an Implant Buster for a 2 count. Cena kept going for the 5 Knuckle Shuffle and it kept being broken up by the third person. Ambrose went for a second Implant Buster, but AJ rolled through it and the two of them clotheslined each other, which led to Cena finally hitting the 5 Knuckle Shuffle. Cena hit the AA on AJ and then a second one on Ambrose, which only got a 2 count. AJ gave Cena a suplex on the ring apron, which is the hardest part of the ring and then almost had Ambrose pinned with the Springboard 450 Splash, but Dean kicked out. AJ hit a Styles Clash on Ambrose, but before he could make the cover Cena ran in and slapped on the STF. Ambrose recovered and held up AJ's hand to avoid the tap. Apparently AJ was unable to tap with the other hand. An amazing series of reversals led to a Pele Kick on Cena and a Lunatic Lariat on AJ. AJ did a flying crossbody on Cena, which never works. You have better odds of giving Cena a power bomb. Anyway, Cena rolled through, but before he could heave AJ up for the AA, AJ rolled through with a Calf Crusher. Finally Ambrose slapped on the Calf Crusher on AJ and Cena used an STF on AJ, which led to Styles tapping. Mike Chioda refused to let that be it, so the match continued. Ambrose hit Dirty Deeds on Cena, but AJ pulled out the referee. Ambrose with a Suicide Dive, but he almost landed on his head. Cena hit the AA off the top on Ambrose...and AJ ran in with a chair and laid out Cena! AJ hit Cena three times with the chair and then....pinned Cena? AJ Styles is still the WWE World Heavyweight Champion and has done it by pinning John Cena for the third time! That's gonna do it from No Mercy! Thank you for reading! I am going out on a limb and betting this match will not be as good as the first match. Nikki Bella wore her Fearless gear. She has no fear that she needs to have good matches. Of course it doesn't help that she's sports entertaining with Carmella tonight. Carmella tried running away and then slapped Nikki. She tried running away a second time, so Nikki slapped her and IT WAS ON! The most exciting part of this match was Mauro Ranallo mentioning that Carmella graduated from nearby UMass Dartmouth. Carmella kicked out of the X Factor and a small package. Nikki got out of the Code of Silence twice and won with Rack Attack 2.0, which is the TKO. If you are in Sacramento and a fan of John Cena, if you ever wanted to meet him you should run to the parking lot in about 10 minutes. Backstage Miz and Maryse showed up in Shane & Daniel's office and said he is going to retire Dolph Ziggler tonight, thanking Daniel Bryan for putting Dolph in these situations to fail. Miz still wants to renogitiate his contract and basically wants Dolph's salary. Uso's debuted a new theme song, which is much less "happy" than their last theme. The challengers cut off Heath Slater to get the heat, causing the fans to chant "Heath's got kids", so Jimmy yelled to the crowd that he has kids too. Rhyno got tagged in and tore through both brothers and set up Jimmy for a Gore, but Jey distracted him and they cut him off. The crowd chanted "ECW" at Rhyno, which is weird since I remember Vladimir Kozlov, Ricky Ortiz and Tyler Reks, but not Rhyno. Oh well, back to seriousness, Heath got the real hot tag and Mauro called him the "One Man Brand" as Heath ran wild. Jey cut off Heath with a Samoan Drop, but Heath gave Jimmy a power slam off the top rope for a near fall. Unfortunately for Heath he ran into Jimmy's foot and got locked in the Tequilla Sunrise, but Rhyno made the save. Rhyno officially got tagged back in and pinned Jimmy with a Gore. Anyone else notice that new theme music almost always equals a loss? Bray Wyatt is speaking in tongues backstage and laughing to himself. Y'know I had this weird feeling that they would close the show. I was wrong. I would like to remind everyone that Jack Swagger lost quickly and cleanly to Jinder Mahal on Raw one night before showing up to feud with Baron Corbin on SmackDown, while Jinder hasn't been on Raw since. Also I should point out that Apollo Crews, Breezango, Kane, Natalya and Naomi are all healthy scratches for this show. The fans like screaming "We the people" but don't seem to care about the match itself. They quickly ended up outside the ring with Baron kicking the ring steps into Swagger's hand. There were lines of people walking out during this match right on camera, with the ones who were left chanted "boring". Corbin ran after Swagger, who was in the corner, and Swagger lifted him up and dropped him on his feet. Corbin didn't come close to hitting anything, but sold it anyway. Swagger used the Swagger Bomb, but couldn't use the Ankle Lock. Corbin used Deep 6 and got mad when he didn't win with a move he never wins with. Swagger got on the Ankle Lock, but Corbin got the apron for the break. Baron thumbed him in the eye and hit End of Days for the pin. Welp I guess we know what's going on last. Alexa Bliss vs Mystery Opponent! Dolph went for cover after cover in the first two minutes. Miz then went for cover after cover and got frustrated when he didn't win the match with moves he has never won a match with. Miz teased a Surfboard and began mocking Daniel Bryan by chanting "Yes! Yes! Yes!" Miz seemed to have the match won with a kick to the face, but he put his feet on the ropes for leverage, which the referee caught. The fans caught on, noticing that Dolph wasn't even trying to kick out, so Miz screwed himself. Miz slapped on the Figure Four, but did it while Dolph was like 3 inches from the ropes. Fortunately for Miz, Dolph didn't seem to care and instead of immediately grabbing the ropes, Dolph stayed in the hold and then actually did have to fight after Miz pulled him into the center of the ring. Maryse distracted the ref so Miz could remove the turnbuckle, but Dolph used the Rough Ryder for a near fall. You know you lose a lot when you need to use other people's moves for near falls. Miz hit Dolph's face off the exposed turnbuckle and a slingshot Sit Out Power Bomb for the nearest near fall possible. Miz used the Daniel Bryan kicks, but Dolph ducked the KO and hit a Zig Zag for a near fall that gave Maryse a heart attack. Dolph locked on a Sleeper Hold, but they were near the ropes, so Miz, with his last gasp, grabbed the ropes. Maryse sprayed hair spray in Dolph's eyes, playing off the Backlash finish. Miz hit the Skull Crushing Finale...but Dolph got his foot on the ropes. If Dolph was 2 inches shorter he wouldn't have made it. Miz pulled off Dolph's boot, but got Super Kicked! Maryse waved to the back and out came Kenny and Mikey from the Spirit Squad! Dolph knocked them off the apron...and Miz hit the Skull Crushing Finale....but Dolph kicked out! The referee kicked out Maryse and the Spirit Squad. Miz complained, turned around and got super kicked and Dolph wins! Dolph wins the title in a match that built really well. Randy Orton was staring at himself in the mirror backstage when it began warping his face. Orton was shocked. I guess he was unaware it was one of those magic mirrors from the circus. To the shock of no one, Naomi was the mystery opponent. When you only have three babyfaces, one is injured and another already had a match it isn't hard to figure it out. Naomi used a split-legged headbutt, but the most exciting part of the match was Naomi's shoes changing colors. Alexa kicked out of the Rear View, but got pinned with a roll up. Alexa threw a tantrum after the match. She may have thought that she lost her #1 Contender status with the loss, but this isn't UFC so no worries. This is Bray's first ppv main event singles match since TLC 2014 when he beat Dean Ambrose in a TLC Match (that weird match where a tv blew up in Ambrose's face. This is Orton's first ppv main event singles match since SummerSlam when Brock Lesnar beat the crap out of him. Orton almost hit the RKO in the first 30 seconds, but Bray rolled outside the ring and started screaming that he liked that before telling a fan to shut up. They fought outside the ring where Randy went for an RKO again, but Bray shoved him over the announce table. Orton set up for yet another RKO attempt when the Bray Wyatt camera cut happened and Luke Harper was standing in the ring, much to the approval of the crowd. Bray hit the Sister Abigail Outta Nowhere for the somewhat surprising win. I heard Erick Rowan was injured, so it makes sense that Harper would come back. They got off the air so quickly that TNA 2007 called and told them to slow down. Talking Smack came right on and Daniel Bryan commented that the production crew put everything together literally just before the show began.